Time: Set-up @ 8:30. Instruction 9-4 with one hour lunch. ​**** This event is now full. Email us at mayflowerpwd@gmail.com for more info or to be added to the waitlist. Stop by our tent for coffee and pastries in the morning. We will be happy to help you learn more about the breed, our club and offer you a chance to win lovely raffle prizes. Plan to join us on Saturday for lunch including lobster roll, chowder, chips, water/soft drink and dessert. Tickets on sale now! Purchase your ticket(s) soon using this link - PWD Specialty Lobster Roll lunch - before they are sold out. ​​**** This event is now full. Email us at mayflowerpwd@gmail.com for more info or to be added to the waitlist. ​The American Kennel Club lists events hosted by its sanctioned clubs, Events types include conformation, agility, obedience, tracking, scent, rally and much more. 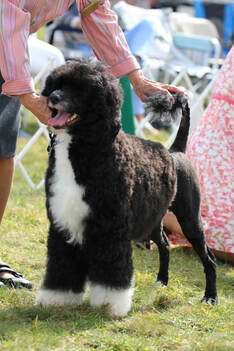 ​Go to https://www.apps.akc.org/apps/event_calendar/​ to find something that you may be interested in watching or entering.